Our full line of custom-made and off-the-shelf connectors includes: Cables & receptacles, multi-pin industrial connectors, panel interface connectors, valve connectors, and a wide variety of cable glands, fittings and adapters. Mencom now offers a wide range of networking solutions for industrial 4.0 smart factory applications. Mencom is very pleased to announce the publication of our new brochure. 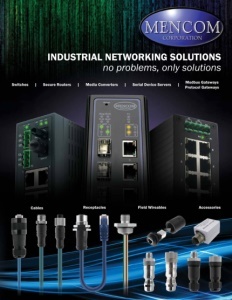 This 16-page brochure contains detailed information of Mencom industrial connectors. With a fresh new look and design, this brochure reflects many enhancements made to Mencom over years. Mencom is the North American Master Distributor for ILME rectangular connectors.